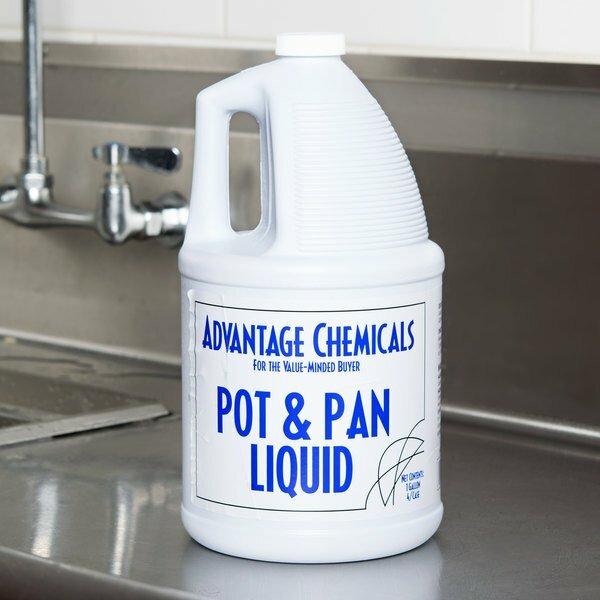 Enjoy an effective dish soap with this Advantage Chemicals 1 gallon container of pot & pan liquid detergent. Both gentle on hands and tough on soils, this economical cleaner creates long-lasting suds that cut through grease and grime with ease, resulting in sparkling clean pots, pans, and dishes. Not only will cooking be easier with cleaner dishes, but your food will also come out tasting better than before! "We wash a lot of dishes in our business so we have to have a lot of dish soap. We love this soap because it cuts through the grease on our pots and containers." 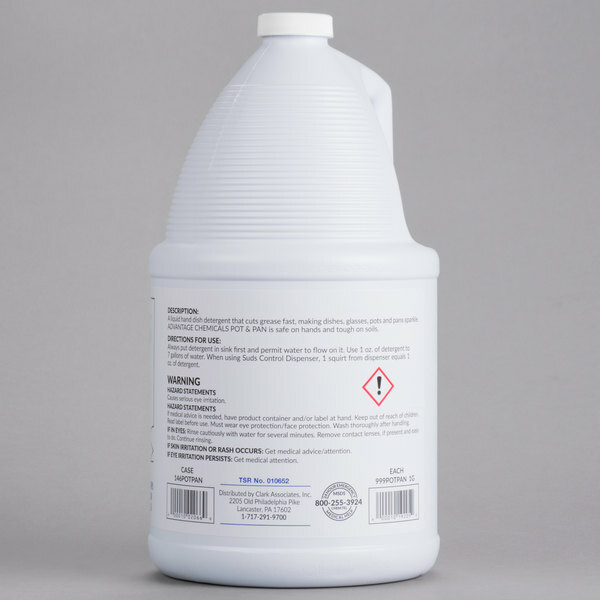 Formulated with prime cleaning agents, this liquid detergent will enhance the quality of cleaning in your establishment by providing a dependable service that your staff will truly appreciate. Even the toughest grease and grime doesn't stand a chance against this detergent. With just a small amount of this moderately foamy pot and pan soap, your surfaces will be sufficiently clean every time. Thanks to this, you'll not only be able to save on product , but you'll also love the quality shine this product brings to your cookware. 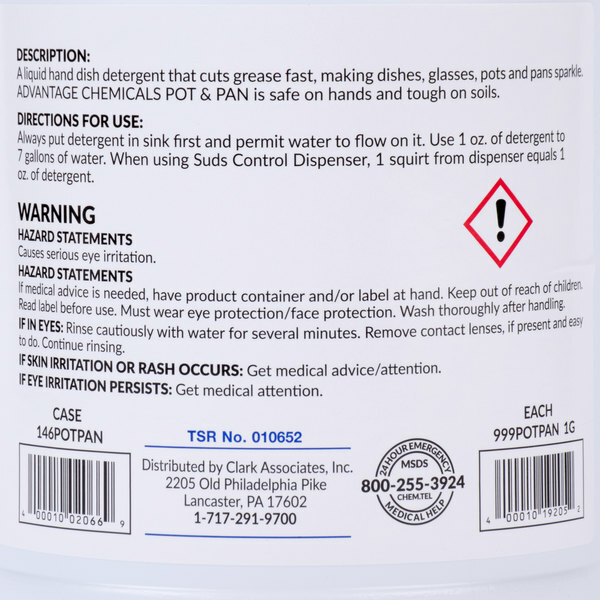 Safety and use instructions are located directly on the label to clearly inform the user of proper handling techniques, a definite benefit in a work environment! In addition, the bulk container is easy to carry with a convenient handle and tight-sealing twist cap to reduce leakage. Perfect for efficient pouring! Advantage Chemical brings you the cleaning and sanitation chemicals you need for a value that can't be beat. 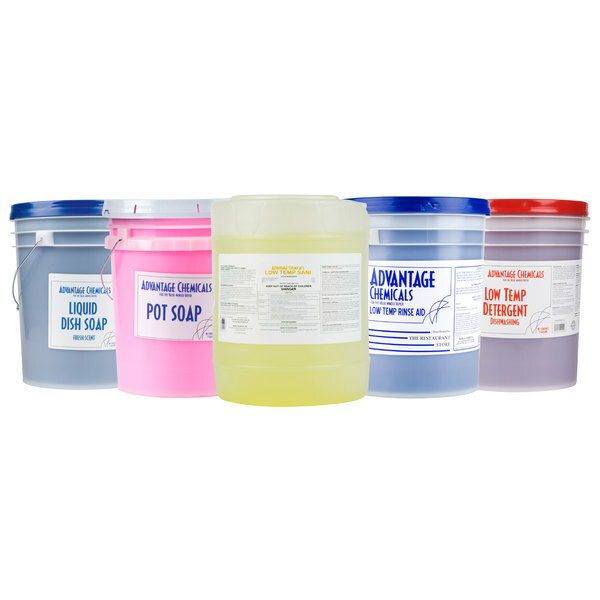 With a line of high-quality glass cleaner, degreaser, hand soap, oven and grill cleaner, cleaning solutions for dish washing machines, and plenty of other fine products, Advantage delivers the best in superior cleaning power for any commercial application. Since we wash all of our barware by hand The product came in handy. It washed our glasses with no spotting or funny smells left behind. I will definitely reorder again in the near future. Really like. It cleans very well. Better than Dawn dish soap. I use it on my pots n pans and they have food stuck on I have soaked them for about ten minutes n stuff comes right off . No more scrubbing hard with wire sponges.i would recommend this product to anyone. Just a great product for the price. We have been saving a lot of money by switching to this. We hand wash a lot of our dishes and this does the trick for us just as good as the more expensive brands. Decent soap but I consider it more for a home use or maybe a presoak versus in a restaurant were we hand wash all our dishes. 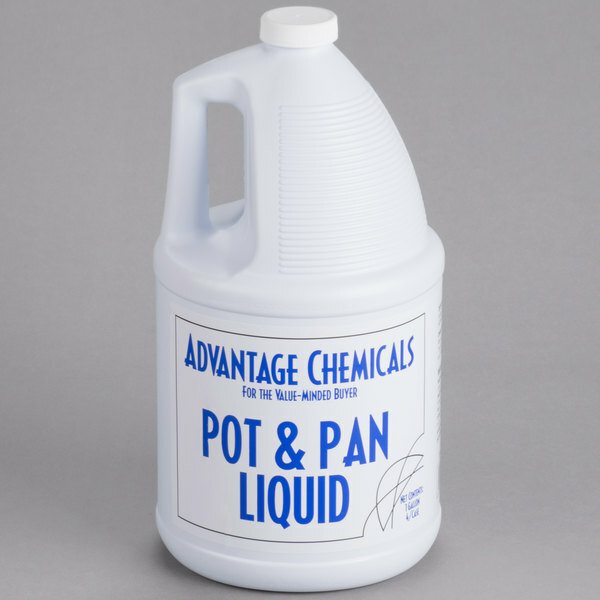 I bought a gallon of this pot and pan detergent to give it a try. However, it was not up to my standards, It creates very little foam when used on a 3 compartment sink and does not remove the grease as well as others. Super good product at a great price. Much cheaper and as good as quality as big box stores. I was able to pass the savings on to my customer and he was super happy. This may look cheap but it works great! It has a pleasant fragrance but it may cause dry skin for some individuals. We would recommend giving this a shot before spending big dollars on essentially the same product. 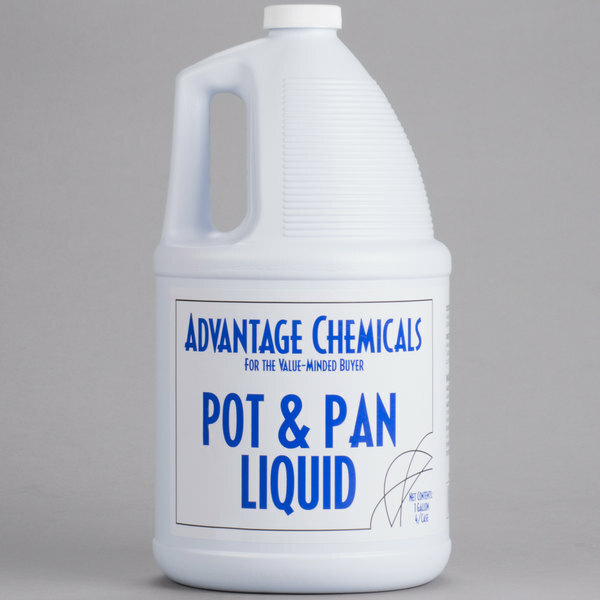 The Advantage Chemicals 1 Gallon Pot and Pan Liquid Detergent smells great and leaves your dishes sparkling clean. The price is great too. I would definitely purchase it again. This one gallon Advantage Chemicals Pot and Pan Liquid Detergent was far more commercial than I expected. The strength and grease fighting agents is impressive and it does not leave a residue like other brands I have tried in the past. I would recommend for even the toughest stains, like dried hardened baked on grease stains because it really is that good!! 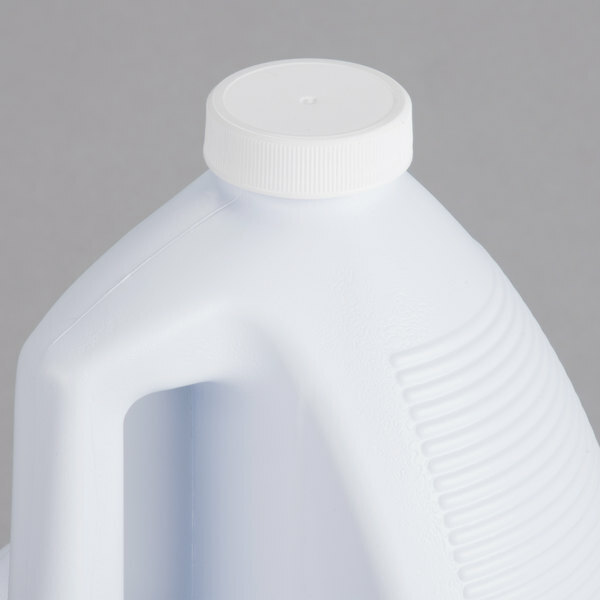 Great bulk quantity dish cleaning detergent. We use this for our hand washing sinks, which process pots, pans, and other cookware. Not too aggressive for hands. so just be aware that this product is specifically for soaking pans/dishes and is not a general liquid dish soap. that said, it works well to cut grease and suds up nicely. the price for such a large amount can't be beat. Good to cut greese on pots and pans and seems to clean them well. Works on other stains like in the fridge or spills on counters too when they are greasy. Great buy! The pot and pan detergent is pretty good on hard, caked on grime. We typically will soak pots and pans for at least 30 minutes before washing. We would recommend this product as it is priced right and works well. Excellent buy when you purchase a case of 4. The detergent doesn't "sud" up quiet like we had hoped, however, it does an excellent job of cutting through grease and grime.